In Financial Regulation Matters, we have looked at a number of issues within the automobile (hereafter ‘auto’) industry, ranging from the positive – the ever-growing expansion of the electric auto market – to the negative – concerns over the finance bubble which is continuing to grow within the sector. Today’s post looks at the latter issue, with news recently suggesting that the inevitable conclusion to the growing ‘bubble’ is drawing ever nearer. There are a number of onlookers who have been quick to note the differences between this bubble and the bubble that exploded in 2007/8, with the common differentiator being that of size. 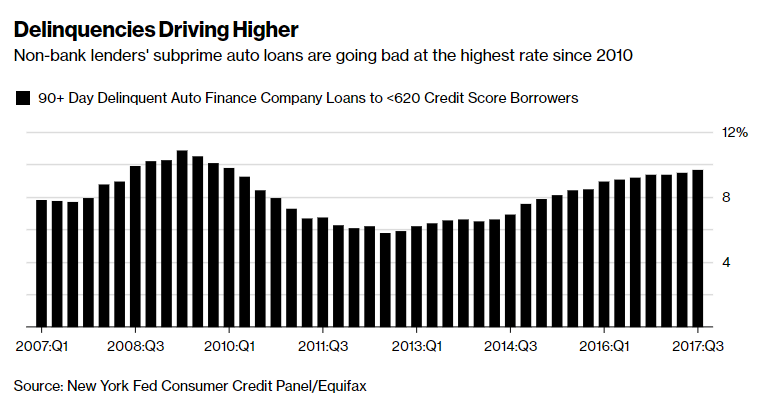 It has been noted that this bursting of a credit bubble is expected to be much different because ‘auto lending is a smaller business relative to mortgages’, with the difference being cited as $280 billion outstanding for auto loans today compared to $1.3 trillion outstanding on mortgage loans at the height of the crisis. 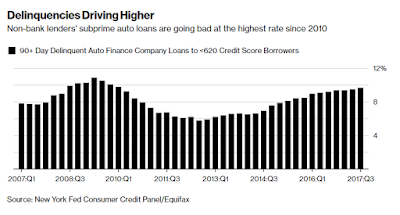 It has also been suggested that a decrease in lending within the sector, mostly based on increased competition and subsequently less margins, has sought to negate the continued expansion of the bubble, although that perhaps does not tell the whole story. Whilst lending in the sector has decreased somewhat, and the relative size to the housing bubble is much smaller, this does not necessarily mean that the effect will be much less dramatic. The environment that this bubble is expanded within is a much different environment that the housing bubble expanded within, with the potential for contagion and the associated effects being particularly acute in the post-Crisis era. Also, whilst onlookers are keen to play down the exposure of the elite financial institutions to this bubble, it is not the case that they are not involved. Goldman Sachs, as just one example, has been noted to be involved in the underwriting of these securities (as one would expect), as to have Wells Fargo and JPMorgan Chase. Furthermore, underneath all of the excessively complicated financial data, the same aspects of the Financial Crisis can be witnessed here, with examples of fraud and predatory lending being cited as growing in response to the tightening margins; this is not surprising in the least, and has been suggested as being representative of the same Ponzi-scheme-like process that we witnessed in the lead-up to 2007/8. Ultimately, there are issues raised within the current news cycle that can be extrapolated to paint a picture of the regulatory framework’s failures in the post-Crisis era. 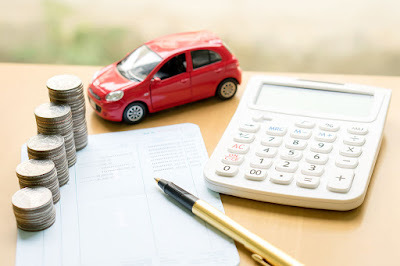 It has been noted that many of the protections that were designed in the wake of the Crisis do not apply to the auto industry, which suggest a narrow-mindedness on behalf of the legislators and regulators. Alternatively however, perhaps it represents something else. Perhaps it represents the constant gamification of the financial arena where the regulators and legislators are inherently one step behind, always reacting. If this is the case, then it is difficult to see how these bubbles can ever be prevented; it is in the modern finance entity’s nature to chase profits and margins, and superimposing a ‘system’ onto a different sector was perhaps the easiest way within which they could achieve the same objectives. There is plenty of blame to go around, as usual, but perhaps it is worth taking a step back for a moment. Rather than looking at financial practice, or the reactionary stance of the regulatory framework, perhaps a fundamental recalibration of the understanding of money is required; the answer to the Crisis within many jurisdictions was to make credit available at all costs, and to increase the availability of credit to consumers as quickly and efficiently as possible. It is arguable that this is the epitome of short-termism, because that system of credit is, essentially, what allows this ‘ponzi-scheme-like’ system to work; what if, and it may sound like a fanciful theory admittedly, the sentiment and narrative was altered to one of saving and responsible purchasing? This revised narrative would work and would have a demonstrable effect upon the ability of high finance to manipulate the system, but perhaps that view is too simplistic. Rather, there is an argument to say that the flow of credit has become a vital component because of the stagnation in wage growth, relatively speaking, or the continued effects of the era of austerity upon many segments of the population – perhaps people’s standard of living would be decimated without the availability of credit, even more so than the devastating effects of austerity? There are then many aspects to this issue, with no clear answer in sight, but what is clear is that there is a game in play in which many within society will pay the cost, and that is unfortunately becoming an understanding that is being more normalised by the day.